Electrical plugs can be damaged from a variety of mishaps, including a rambunctious puppy. If an electrical plug becomes damaged, the cord most often can be saved, but to properly repair a chewed up electrical plug, the old plug should be removed and replaced. Fortunately replacing a plug on an electrical cord can be done in a few minutes with a screwdriver, wire cutters and a replacement plug obtained at most hardware, home improvement or department stores. Most do-it-yourselfers can replace an electrical plug in a few minutes. Determine if the cord and plug are of a two- or three-wire configuration. A three-wire electrical cord, with the ground wire in the middle, is connected to a three-prong electrical plug. A two-wire plug and cord will not have a grounding wire. Secure a replacement plug of the same configuration. Mark the wire on the side of the electrical cord attached to the side of the plug with the wider prong; this is the "neutral" wire. Use the electrical pliers to cut the electrical cord as close as possible to the damaged plug. 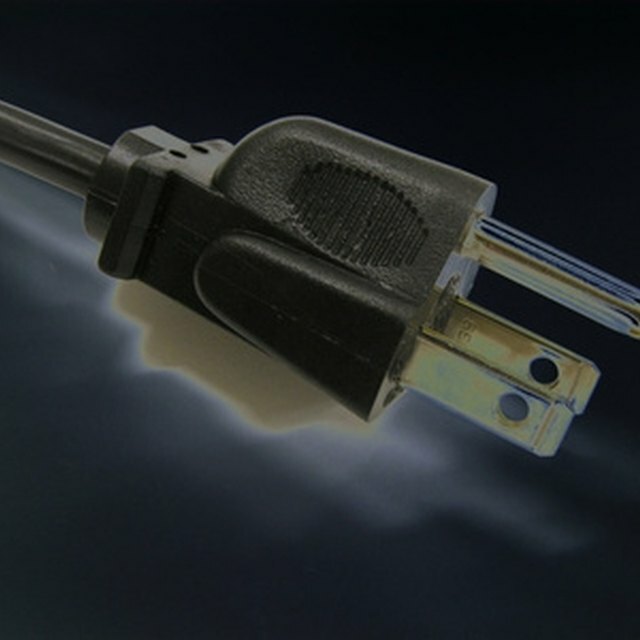 When removing the plug, cut away any part of the cord near the plug where the insulated appears to have been compromised. Separate the three wires on the electrical cord, approximately one-inch down the length, by gently pulling the wires apart with your fingers. Strip approximately 1/2-inch of insulation from the ends of the wires using the wire strippers. Remove the retaining screw from the new electrical plug cover using a screwdriver and pull it open. Wrap the stripped ends of the black hot wire, the white neutral wire and green ground wire, if so equipped, around the respectively colored terminal attachment screws on the inside of the plug. If the wires on the cord are not color-coded, attach the wire you marked before removing the plug to the neutral terminal of the plug. The neutral terminal on the plug will be marked "N" or "neutral" or the neutral terminal screw will be silver, whereas the "hot" terminal screw will be darker. Secure the wires in place by tightening the screws with the screwdriver. Lay the cord into the cord channel on the plug. Replace the cover and tighten the cover retaining screw in place using the screwdriver.